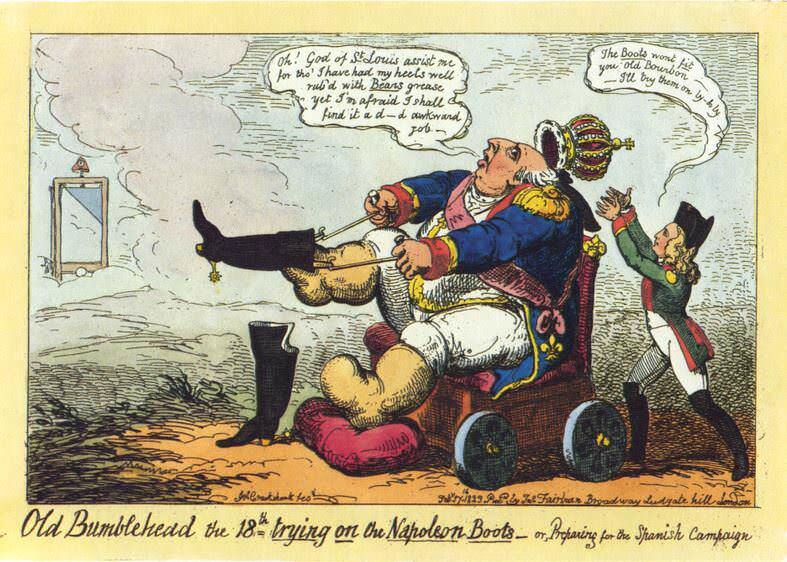 Old Bumblehead the 18th trying on the Napoleon Boots, or Preparing for the Spanish Campaign, caricature by George Cruikshank, 1823. That’s Napoleon’s son, the Duke of Reichstadt, standing behind Louis XVIII, ready to catch the crown. Napoleon in America takes place, in part, against the backdrop of a French invasion of Spain. This invasion was not invented for the novel. It actually happened, in 1823, to restore a Spanish Bourbon king to the throne. It was a huge deal at the time, both in Europe and the Americas. Newspapers, diplomatic reports, memoirs and letters of the period are full of commentary on the events leading up to the invasion, the resulting war, and its aftermath. Here is a very abbreviated account of what transpired. The 100,000 sons of Saint Louis – otherwise known as the Army of the Pyrenees, mobilized for the invasion – actually numbered around 60,000. The problem of ensuring soldiers’ loyalty without compromising their efficiency was dealt with by giving primary commands to former Napoleonic generals (who had the necessary experience) and secondary commands to royalists (who were unlikely to mutiny). Louis XVIII’s nephew, the Duke of Angoulême was made commander-in-chief, despite his lack of military experience. He was not keen on the appointment, but agreed to it as an honourary post, leaving the army’s actual military direction to General Armand Guilleminot, who had served under Napoleon. On April 6, 1823, the question of the army’s allegiance was answered. 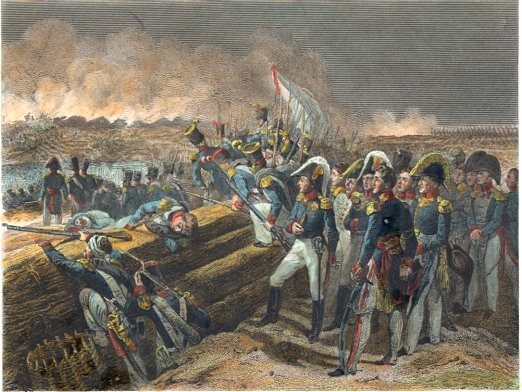 Just as happens in Napoleon in America, a group of insurgents led by Colonel Charles Fabvier tried to subvert the French forces at the Bidassoa River who were preparing to enter Spain. Fabvier’s group hoisted the tricolour flag, sang “La Marseillaise” and urged the soldiers to desert the Bourbons. Instead the French troops obeyed General Louis Vallin’s orders to open fire on Fabvier and his men. Niles’ Weekly Register, 24, March 15, 1823, p. 29. Le Livre Noir de Messieurs Delavau et Franchet, Vol. 1 (Paris, 1829), pp. 52-54. Michael J. Quin, A Visit to Spain, Detailing the Transactions which occurred during a Residence in that Country, in the latter part of 1822, and the first four months of 1823 (London: Hurst, Robinson and Co., 1824), pp. 317, 343. François-René de Chateaubriand, The Congress of Verona, Vol. II (London, 1838), p. 397.